In high school, students focus on higher math, including Functions, Relations, Advanced Functions and Calculus in preparation for placement in University programs. Students wishing to study in the US may also be preparing for SATs..
By the time they reach high school, all students perform at different skill levels. To determine each student’s abilities, we give each one a written and verbal assessment unique to Mathnasium. Based on the assessment results, our team builds a customized learning plan designed to fit the student’s specific needs in two important ways—to avoid spending time on things they already know and to strengthen the things they need help on. We understand the pressures and busy schedules our high school students face, so our focus is to help with immediate problems, such as homework help and test prep, while filling in any foundational gaps in their mathematical knowledge. The goal is to enhance their performance in the crucial exams they’ll be taking that can have a great effect on their future. 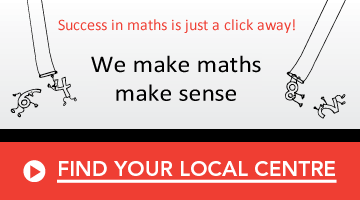 Our experienced math instructors provide homework and study help that addresses gaps in knowledge. As these gaps close, students understand the material better, boost homework confidence, and improve their grades. With this help, instead of seeing homework as a burden, students begin to see it as a welcome challenge and an opportunity for further learning. Students who prepare for standardized tests such as high school exit exams and University entrace and placement exams at Mathnasium enjoy a substantial advantage over those who don’t. We provide each student with a test prep curriculum customized to their specific needs. To assess their math skills, each student is given a math skills assessment. Based on the strengths and weaknesses identified in this assessment, we develop a personal instruction plan for the student. Working with that—and giving them practical practice in test taking—we optimize their performance. The result: enhanced results on the actual exams and a more positive step into their future. How are my math skills?